Boxfish, cowfish and trunkfishes are all members of the Ostraciidae family. They are very unique in appearance and unlikely to ne confused with any other species! Their characteristic shape, seemingly awkward swimming style, and very animated looks have earned them a dedicated following amongst aquarists. Boxfish are a favorite for large aquariums such as those found at zoos or public aquariums. 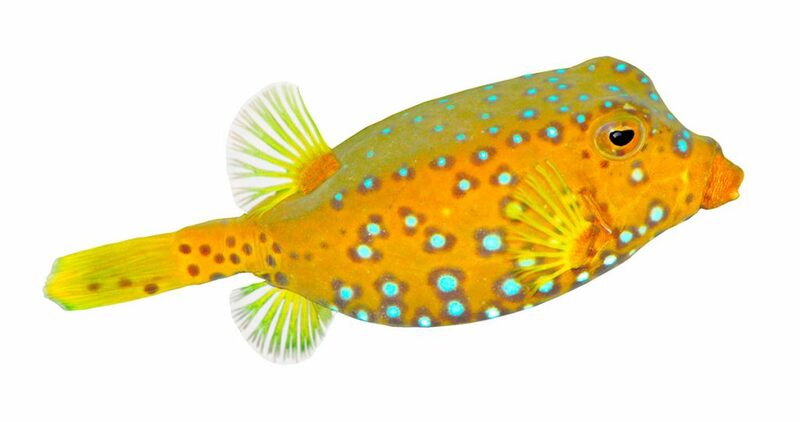 One of the most unique aspects to boxfish biology is their ability to produce a noxious chemical known as Ostracitoxin. In addition, boxfish are covered in armor like scales to aid in protection from predators. Boxfish can be somewhat finicky upon initial acclimation to captivity, however once established they are relatively hardy. Due to the large size and ability to release poison, and tendency to pick at invertebrates in reef aquariums, they are best for large dedicated fish only tanks. One of the primary challenges of maintaining boxfish in captivity is the difficulty associated with feeding them. Many freshly imported specimens can be reluctant to begin feeding in captivity, however offering high quality meaty foods will often entice them to begin feeding. Most boxfish species found in the aquarium trade, such as the Longhorn Cowfish, are available as small, brightly colored juveniles. However, it is important to consider the adult size of these fish, which is often in excess of 16” in length. An aquarium of 125 gallons in size or larger will be suitable for an adult boxfish.